When it comes to the wedding and engagement photography awards that we have been fortunate enough to win, we have no favorites. We are equally proud of any of the honors that we have received from our peers in the wedding and engagement photography industry. We consider ourselves lucky to be surrounded by such extraordinarily talented people who inspire us to keep improving our craft, and any time they deem our photographs worthy of appreciation, we consider it an enormous honor. Each award that we have won, however, has made us proud of our work in a unique way. Different wedding and engagement photography awards tend to emphasize different aspects of the art of photographing marriage celebrations in their mission statements, so naturally the awards they bestow tend to be given to the images that best reflect their guiding principles. In the case of This is Reportage, this means celebrating the photographs that do a superlative job of narrating the stories (whether big or small) that play out on a couple’s wedding day. This is Reportage strives to recognize the importance of this side of wedding and engagement photography and to reward the photographers who produce the most emotionally impactful images of unscripted moments. In our time as wedding and engagement photographers, we have always found wedding photography to be a fascinating mix of posed and unposed pictures. Some of the most beautiful images (and those that the bride and groom often treasure most) result from the photographer directing the couple and/or their families, putting them in settings and positions that make them look their best. Couples portraits and family formal photos can sometimes be the most unforgettable images from a marriage celebration for the very simple reason that we wedding photographers have the opportunity to control most aspects of the shot. For that same reason, unposed or documentary-style photographs tend to be a little rougher around the edges. A wedding photographer usually cannot determine where and when significant moments will happen. The lighting will not always be cooperative nor will the background always be the most flattering. But what reportage pictures lack in polish, they tend to make up for in emotional impact. Posed pictures might look beautiful, but it is hard to make them spontaneous. The best photographs of a wedding’s most significant moments, on the other hand, capture and highlight the feelings — excitement, joy, fear, slight sadness, relief — that make a couple’s nuptials such a special and moving affair. It is an aspect of wedding photography that matters a great deal to us, and we spend a lot of time trying to perfect our craft in this area. That is why we are extraordinarily honored and proud to have won several This is Reportage awards, including one for the photo featured here. We took it at a lovely indoor/outdoor wedding ceremony in suburban Washington, DC. 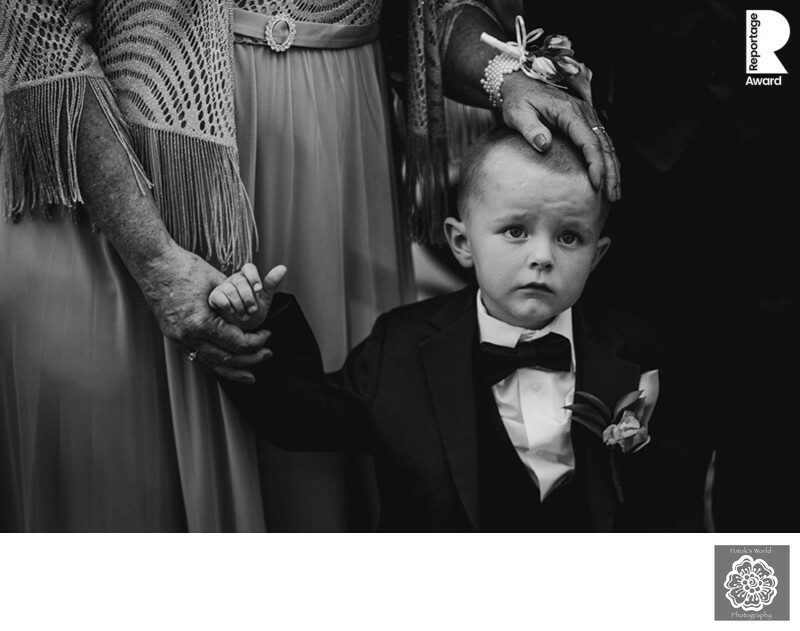 The groom had two sons from a previous relationship, and the adorable little guys spent most of the morning keeping their dad company as he got into his wedding tuxedo. When the moment of truth came along, though, they had to let him go up to the altar alone while the young men stayed behind with their grandparents. It was obvious to all the wedding guests in attendance that the boys were feeling a lot of different emotions. They were happy for their dad, of course, and for his soon-to-be-wife, but they were also a bit scared about the change in their lives and also overwhelmed by the crowd, the noise and the mid-summer Washington heat. This is all apparent on the face of the little man in this photograph. What really makes the image lovely, though, is the way that his grandmother has placed her hands gently on his head and shoulder in an effort to reassure him that no matter what, he will always have people in his life who love him. Location: Foxchase Manor, 8310 Chatsworth Dr, Manassas, VA 20109.